In my last post, we talked about how to identify good projects and how to avoid scams using our five point analysis. Let’s say that we have found a good project... what should we do next? First and foremost, we have to identify what our game plan is. Are we traders or are we investors? The answer to this question will help us frame our perspective. If we are a trader looking for short term swings, we will be zooming into smaller time periods (5, 15, 30 min, 1hr, 4hr). If we are investors, we are looking at the bigger picture (1 day, 1 week) and less interested in the ups and downs of the day to day. 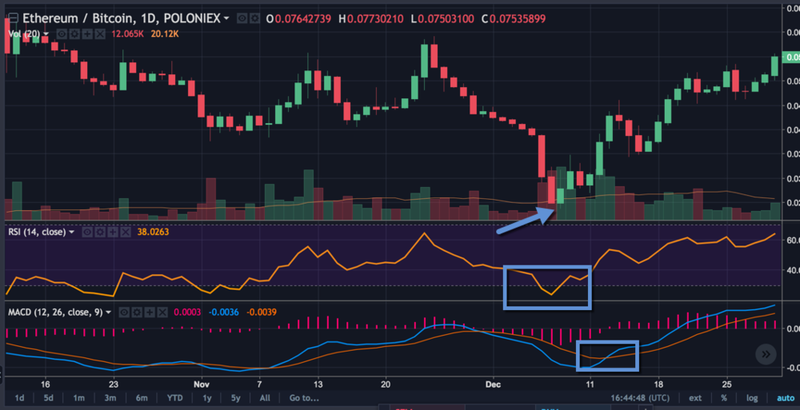 Regardless if you are a trader or an investor, RSI, Volume, and MACD are powerful indicators that can help you anticipate changes in trend and momentum. Before we see how these tools come together, let’s look at each individually. The relative strength index (RSI) is a momentum indicator that is primarily used to signal overbought or oversold trading conditions. RSI = 100 - 100 / (1 + RS) Where RS = average gain of "up" periods during the specified time frame / average loss of "down" periods during the specified time frame (typically 14 periods). The RSI of an asset will range from 0 to 100. As a general rule of thumb when the RSI moves above 70 the asset can be said to be overbought, when the RSI moves below 30, the asset can be said to be oversold. When looking for a buy entry we are looking for oversold conditions. This will typically occur during market corrections when the price falls too far too quickly. I’ve found RSI signals to be most telling when you look at the 4hr or daily time frames because you are looking at the bigger picture. RSI will oscillate more frequently in the shorter time periods (5, 15, 30 min, 1hr) as it reacts to the current price action. I strongly encourage you to analyze your asset(s) on multiple time frames as different perspectives can tell different stories. However, when multiple time frames are telling the same story, you can be more certain about your decision and expect a stronger bounce. Volume - how fast are we going? Volume is a measure of the total buying and selling (in terms of USD, BTC, etc) that occurs within a given time period. Volume can be used as a comparative indicator to analyze the momentum (strength) of a current price trend. Take a look at the previous candles on your chart, is the volume increasing or decreasing? Bulls (those betting/hoping for market to trend up) want to see increasing volume on an uptrend and decreasing volume on a downtrend. As someone looking to buy, you must be a bull! So what does that imply? If we are in a down market we are looking for decreasing volume to signal a slowing-down of the current trend and a potential consolidation or a reversal. If we are in an up market then we would want to see increasing volume to signal a continuation of the current trend. An analogy I use to help me understand volume goes like this: if “price” is a car, volume is the gas that is taking it up or down the road. Volume climaxes are key as they tend to occur at the top of a bull move or at the bottom of a downtrend, signaling a potential change in the current price trend. Increased volume could be due to profit taking at the top, or increased volume from bulls indicating greater demand at the current price level--maybe they got an oversold RSI signal? Moving Average Convergence Divergence (MACD) is a trend-following indicator that shows us the relationship between short term and long term price averages (typically the 12 and 26-day EMAs). MACD is expressed as the 12-day EMA - 26 day EMA. It is plotted along side the 9-day EMA which serves as a signal for buying and selling opportunities. When the MACD crosses above the signal, this is a bullish signal that indicates a potential trend change to the upside. When the MACD crosses below the signal line, this is a signal that a market correction may be coming. MACD is a great tool for longer-term trades. I have found MACD to be most useful on the 4hr and daily time frames. When you zoom in any closer than that, MACD crosses tend to lose their significance. When looking for an entry, I look for a bullish MACD cross above the signal line to confirm an upward price trend. If you made it this far, kudos to you. These indicators take some time to digest, but alas here are potential trade setups using RSI, Volume and MACD. I would like to stress that I am not financial advisor. Please do your due diligence and research these concepts for yourself. You should note that no one indicator will have all the information you need to make a successful trade. Indicators are never a guarantee of direction or price action, its best to keep a pulse on the market and continually adjust your predictions. The tools covered in this post aren’t a recipe for success, but they can GREATLY increase your odds of finding winning trades.